If you are adding a new payroll to PaySuite during the tax year (i.e. not in the starting period of the tax year) and are adding existing Employee records to this new payroll, you will need to ensure that the new record created also has any Year to Date values recorded against it. Click Employees on the left pane. Click the employee you wish to enter YTD figures for. Click Year to Date on the left menu. You will notice all the fields are inactive. To make the field active and available to change, click Make Adjustments on the bottom right corner. 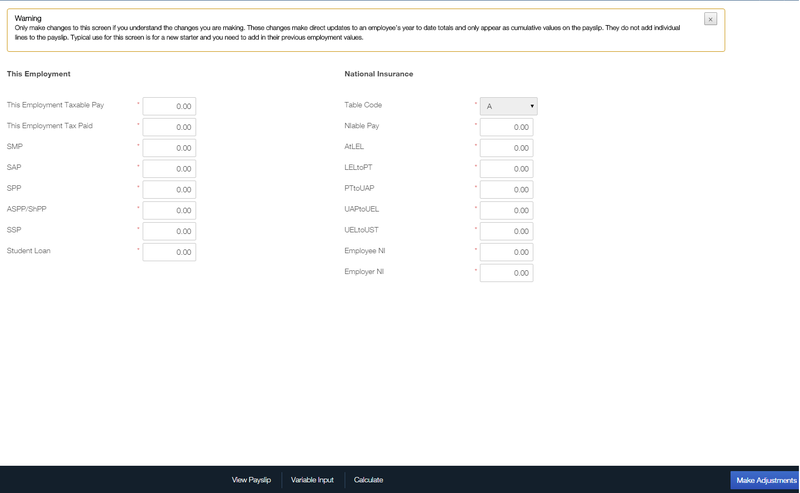 Add the Year to Date values for the appropriate fields into the Adjustments column, for both sections; This Employment and National Insurance. This Employment Tax Paid - Tax the employee has been deducted in your employment in this tax year. Once you have entered the necessary figures, click Save. Once you have approved the first payrun in PaySuite, it will include the YTD you have manually entered in the employee details.